I have a lot of parents asking me how to handle feeding our kids around the holidays. Just as I shared with Amy over at Yummy Toddler Food this week and last, there are some key considerations that I think will help lessen your stress around what your kids are eating, or more so, being offered this time of year. One of the best ways to ensure your kiddos are getting at least a few healthy bites in each day is to focus on fun, festive veggie-based appetizers. Rather than filling up on less nourishing snack foods, consider putting out a platter with these individual turkey veggie cups before the big holiday meal. Created for a Friendsgiving playdate in the park I hosted over on the Sneakz blog (sponsored post), these are the perfect portion for small hands to hold, dip, and enjoy! Rather than buy several different bags of veggies, save yourself the time and excess at the store by purchasing a small veggie platter. This will have several different types of veggies included that can then be divided among cups. Assemble turkey cups by fixing googly eyes and beak onto each. Place cup down to dry. While the beak and eyes dry, add veggie dip of choice to the bottom of each cup. Add one or two of each veggie to each plastic cup, setting them in the veggie dip. To see more ideas on how to use this recipe and others, hop on over to the Sneakz blog for the full Friendsgiving Picnic in the Park menu (sponsored)! Want to make a large veggie platter instead? Need to bring an appetizer to your Thanksgiving gathering? Consider making a larger veggie platter instead. The one featured on my Friendsgiving post with the Littles and Me (shown below) is fun option for a crowd! Wishing you and your family a healthy, happy holiday tomorrow and into the weekend ahead! 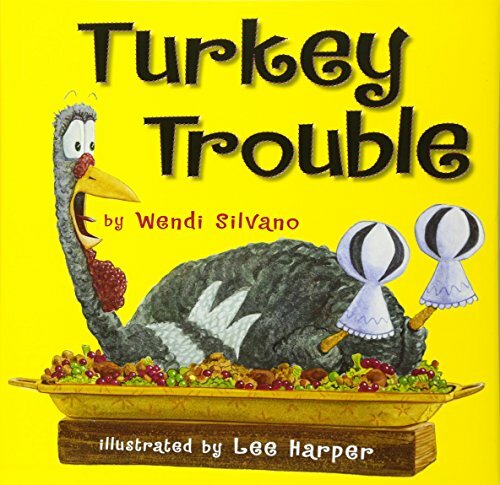 I am always looking for fun seasonal books to add to our library, so I was thrilled to learn of "Turkey Trouble" when Beth and Ludavia suggested it for this month's Book Box. This is a silly story that instantly got my littlest trying to gobble like a turkey and then act out all of the turkey's silly farm friends. The disguise element had my oldest's eager for more silly dress up ideas, something three year olds can just never seem to get enough of! That's why I am especially excited to have so many resources now for how to make Turkey Trouble even more fun and engaging, thanks to partnering with Beth, Ludavia, and Mandisa for this month Book Box Snacktivity. Together, we have come up with four ways to enjoy this book all month long. Each are simple to implement and age-appropriate for kids from your youngest to your oldest. 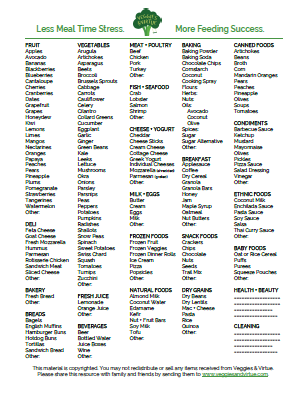 Add to it the edible element below, and this is sure to be a book your family with eat right up this Thanksgiving season. We hope you and your little turkeys will find joy, laughter, and a healthy dose of hands on learning through this month's activities! With pear half in hand, gently poke a small hole for each chocolate chip. Make a third small hole for the beak. 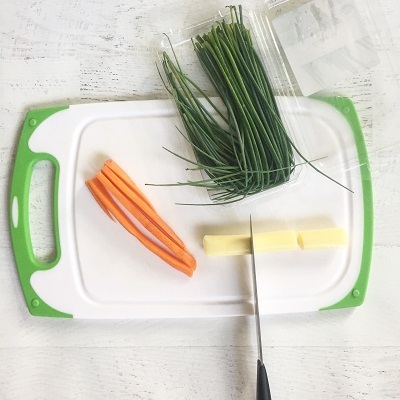 To make feet and beak, cut carrot lengthwise in four slices or until carrot is to desired thickness. Carefully cut a three pronged foot from the end of each carrot slice. Trim down to include a small leg as well. With remaining carrot pieces, carve one triangle beak per turkey being built. Place pear half flesh side down on plate. Insert “eyes” and “beak.” Place feet/legs at the base of pear. 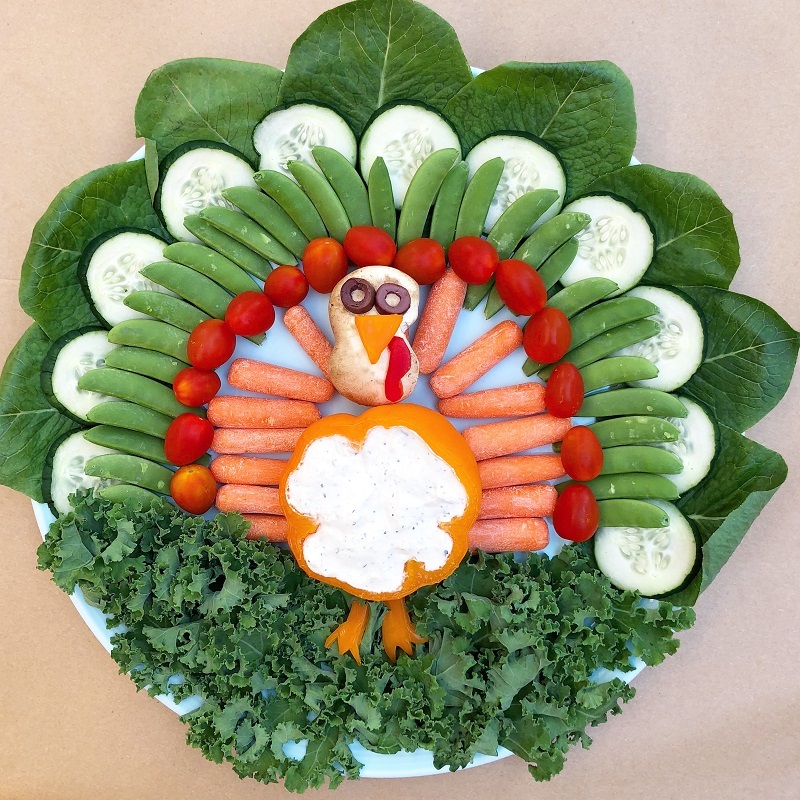 Provide child a plate large enough to create their own turkey on (suggest at least 8” diameter). 4. Fill muffin tin with an assortment of colorful fruit "feather" options. Allow child to practice patterns, play with different shapes and textures, and taste test each of the "feathers." 5. Once created, enjoy this snacktivity while reading "Turkey Trouble." 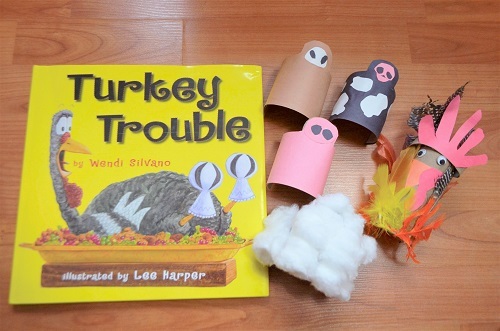 Want to do more creative and kid-friendly ideas with this month's book, "Turkey Trouble?" Be sure to check out the links and age-appropriate learning activities from each of the following mom bloggers! 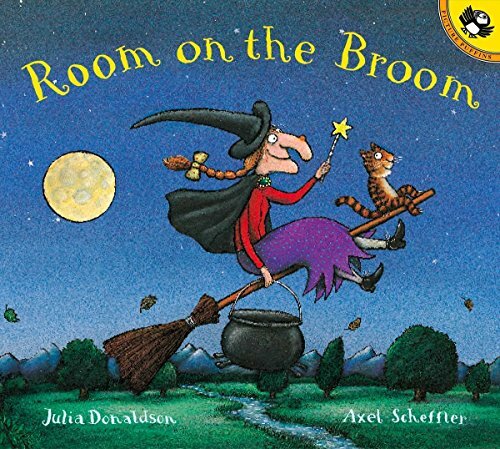 Each introduces you to new ways for your child to imagine, learn, explore, and engage with this fun seasonal story. 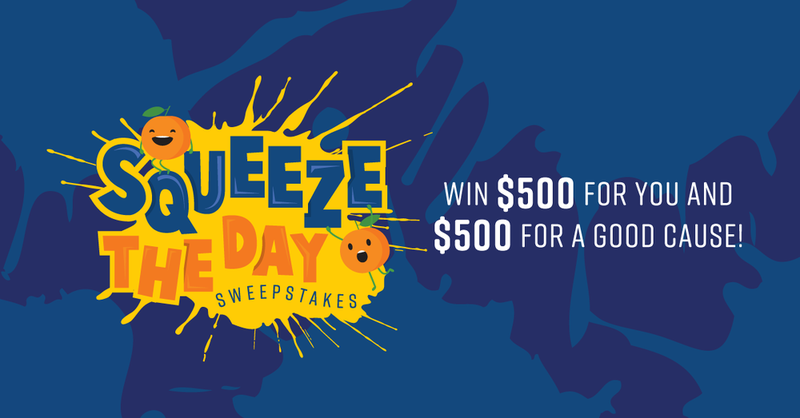 Visit Days with Grey for this easy, engaging, and educational outdoor activity! 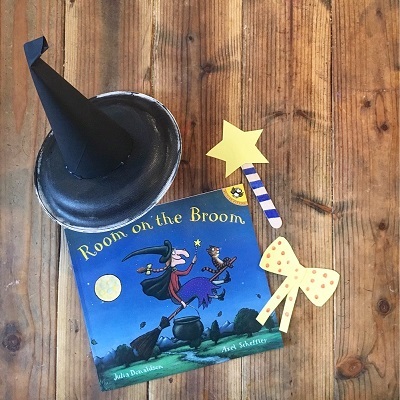 Visit The Mama Workshop to see these cute ideas to dress up and disguise the turkey in this story! Visit Happy Toddler Playtime for more ways to disguise the turkey using supplies you surely already have on hand! What is your family's favorite story for the Thanksgiving season? Come share over on my Instagram or Veggies & Virtue on Facebook!